Oh, Mr. Kors. To say that you've effectively killed it with this Miranda tote would be the understatement of the year. 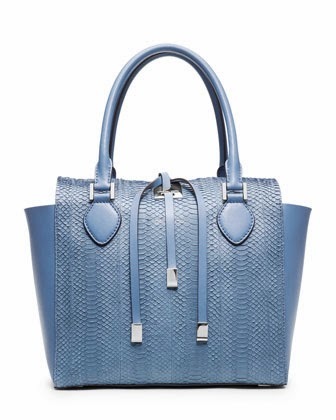 That powder blue color I'm obsessed with, the shape, the python-embossed leather and perfectly placed silver hardware. If it weren't for the fact that I chose to write a post about this purse, I would have no words -- that's how much I love it. Smitten, if you will. This beauty is part of the higher-end Michael Kors collection, so the price tag is completely out of reach at the moment. (Because, for some reason, nursery furniture trumps a new purse.) But I could easily see myself snatching this up, or any of the other Miranda bags, after saving my pennies for a while. Push present, anyone?